Lieutenant General Sir Robert Stephenson Smyth Baden-Powell is a man of 69, with upright carriage and snapping eye, such as become a veteran who has campaigned in Zululand, Ashanti, Matabeleland, at Mafeking, in the Transvaal. King Edward dubbed him Knight, King George dubbed him Baronet, 600,000 American boys call him "Chief Scout of the World," and last week at the 16th annual convention of the Boy Scouts of America, Dan Beard, chief U. S. scout, presented him with a silver buffalo and called him "our contemporaneous ancestor." During the first presentation in 1926, twenty-two awards were presented in a particular order determined by Chief Scout Executive James E. West. Since then, the awards have been presented on an annual basis in alphabetical order. 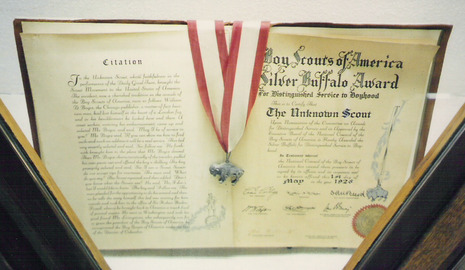 The first Silver Buffalo Award was conferred upon Lord Baden-Powell, founder of the Scouting movement and Chief Scout of the World. The second went to the Unknown Scout who inspired William D. Boyce to form the BSA. 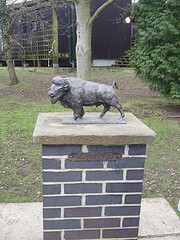 This award is represented by a small buffalo statue in Gilwell Park. For fifty years the Silver Buffalo was awarded only to men until LaVern W. Parmley became the first woman to receive the honor in 1976. As of 2008, 674 people have been presented the award, including 14 presidents of the United States.